Need an appetizer in less than 15 minutes? With two-steps of prep this cheesy spinach dip is ready in no time. Microwave Velveeta and tomatoes in medium microwaveable bowl on HIGH 5 min. or until Velveeta is completely melted, stirring every 2 min. Add spinach and crushed pepper; mix well. Microwave 2 min. or until heated through; stir. Serve with crackers or assorted cut-up fresh vegetables. For extra flavour and tang, add 1 finely chopped jalepeno pepper to the Velveeta mixture with the spinach and crushed pepper. 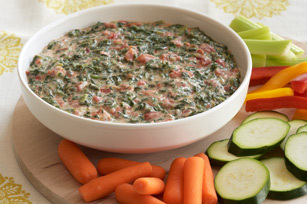 This tasty dip can be part of a healthful eating plan.